I Love You Messages for Dad: Don’t wait for Father’s Day or a birthday to express your feelings. Write a sweet quote and post in on Facebook, Twitter and Pinterest to show how much you love him. 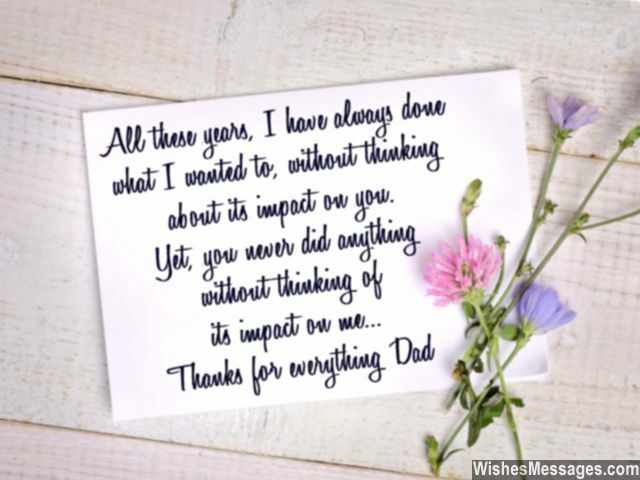 You can take your father-son or daddy-daughter relationship to a whole new level by writing a cute message on a greeting card or a handwritten note on a random day. Most children don’t understand the importance of a dad’s contribution in their lives until it is too late. Don’t let this happen to you – no matter how uncool, weird or funny it sounds, use every opportunity to give your old man a hug and thank him for being there for you. 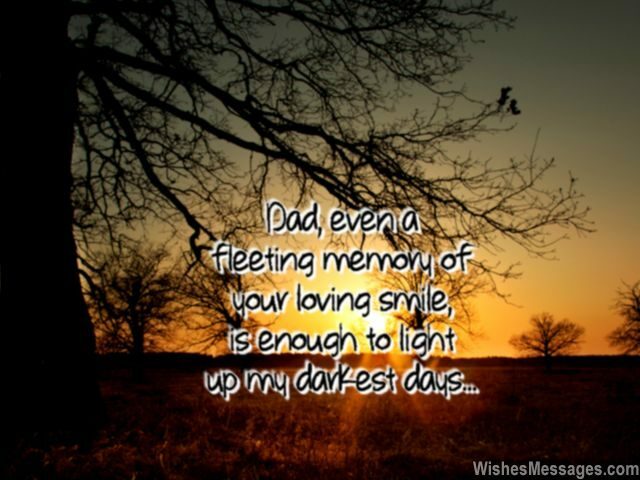 1) Dad, even a fleeting memory of your loving smile is enough to light up my darkest days. I love you. 2) My life is like a comic book because whenever I am in trouble, I am always saved by a hero called SUPERDAD. I love you. 3) You hug me even when I am wrong, you pat me on the back even when I fail. You smile at me even when I lie, you forgive me even when I curse. If there is anything in life that keeps me going… it’s you, dad. 4) I may detest your advice, abhor your suggestions and loathe your opinions. But that doesn’t stop me from loving the man behind them all… dad, I love you. 5) No matter how old my daddy becomes, he will always be the first man who held me up in his arms and cuddled me as if I was the queen of the world. I love you daddy. 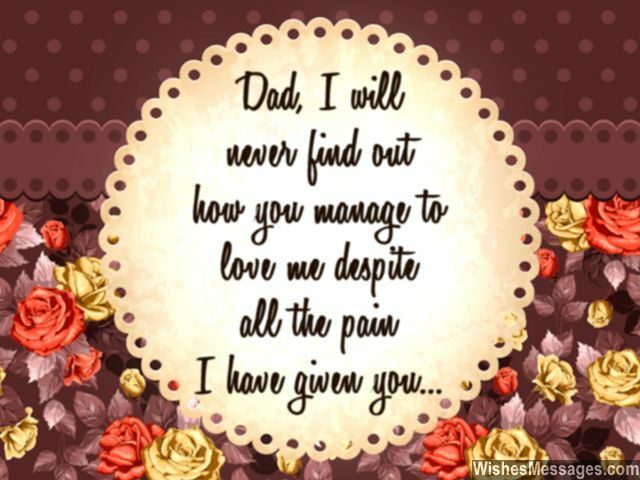 6) Dad, I will never find out how you manage to love me despite all the pain I have given you. Sometimes I feel that my brutal lies and hurtful curses don’t deserve the selfless love of an affectionate dad like you. I love you dad. 7) I will never understand the kind of love you have for me… the kind that makes you want to give me a hug while I am giving you my mood swings. I love you dad. 8) A man who can singlehandedly raise his children, pay the mortgage and make an honest buck is a hero in my books any day. I love you dad. 9) My daddy is a magnet who has pulled me away from the worst and close to the best of what life has to offer. I love you. 10) Every girl dreams about living the life of a princess. I have never dreamed of that because I have always been treated like a princess by you. I love you daddy. 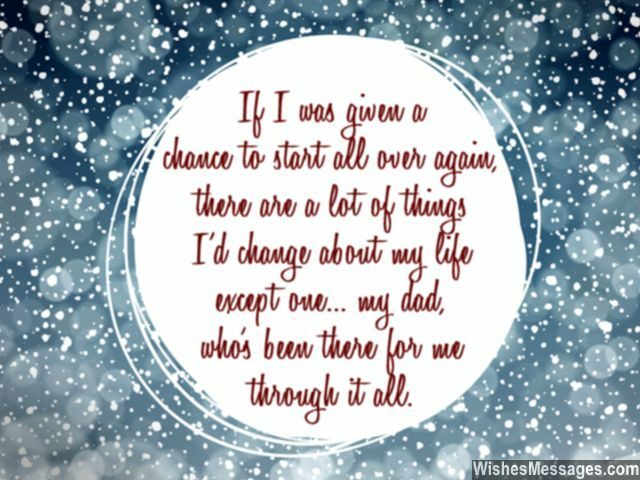 11) If I was given a chance to start all over again, there are a lot of things I’d change about my life except one thing… my dad, who’s been there for me through it all. Love you. 12) You brought me every single toy that I wanted when I was young. I hope I can return the favor when I grow up by achieving every single goal that you always wanted me to. I love you. 13) I want to be the most amazing child in the world because the most amazing father in the world deserves nothing less than that. I love you. 14) My love for you is like a freeway during peak hour. It is plagued by the traffic of my teeny tantrums and stoplights of my moody outburst. But at the end of the day it leads straight to just one destination – your heart. I love you daddy. 15) I am going to write a letter to Facebook to put a HUG button on your profile so I can hug you anytime I want. I love you daddy. 16) All these years, I have always done what I wanted to, without thinking about its impact on you. Yet, you never did anything without thinking of its impact of me. Thanks for everything dad. 17) The worst part of being your son is that following your footsteps is going to be more difficult that climbing the highest mountain. I love you. 18) Dad… sometimes I don’t say Hi, sometimes I don’t give you hugs. Sometimes I ignore you, sometimes I get annoyed at you. Regardless of my moody SOMETIMES, I want you to know that deep down inside I love you ALL THE TIME. 19) When friends walk away, when life seems to come to a halt and when the world seems like the most cruel and heartless place… I think of you and everything seems perfect all over again. I love you dad. 20) There may be a thousand ways to say I Love You to a father. But for me, there is just one way to love you… UNCONDITIONALLY. I love you dad. 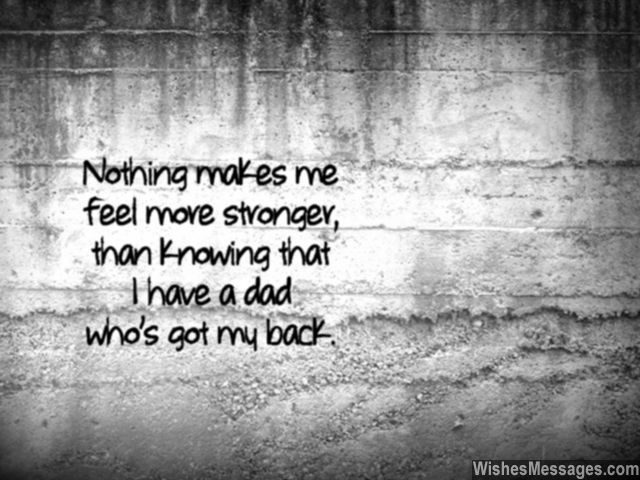 21) Nothing makes me feel more stronger, than knowing that I have a dad who’s got my back. I love you. 22) Dad, I want to invent a time machine so I can rewind to my childhood and hit pause, to relive all the awesome memories I share with you. I love you. 23) Real men are not those who kill all the bad guys and save the world in movies. Real men are those who strive to be great fathers to their children to make the world a better place – just like you. I love you dad. 24) My friends binge on ice cream and chocolate when they feel down and out. I just pick up the phone and call my dad. I love you. 25) Superman is not a fictional character found only in comic books and movies. He is my dad who I love to bits. 26) You have seen me at my worst, yet you think that I am the best. I love you dad. 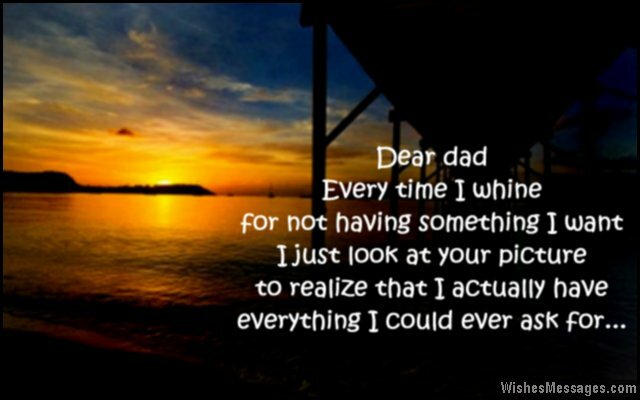 27) You have the most difficult job in the world called BEST DAD. It involves dealing with the toughest customers and clients in the world called TEENAGE SON and TEENAGE DAUGHTER. We love you daddy. 28) I expect a lot from all my friends because my dad has set high standards of friendship… by being my best friend since childhood. I love you. 29) How do I describe my daddy? I just add the three letters EST after Cool, Strong and Best. I love you dad. 30) If all daddies of the world were like you, the future of all children would be easily predictable – perfect. I love you dad. 31) Every time I whine for not having something I want, I see your picture to realize that I actually have everything I could ever ask for. I love you dad. 32) Every dad can treat his daughter like a princess… but very few like you, can teach their daughters how to take on the world like a queen. I love you. 33) If a man’s success is measured by how much his children love him, you are the most successful man ever. Daddy, we love you. 34) My dream is to make you the happiest dad in the world while your dream is to make me the happiest daughter in the world. How perfect! I love you dad. 35) Daddy… your hugs are the shelter that protects me from all the storms life could possibly push me into. I love you. 36) I may be daddy’s LITTLE girl, but I am also his BIGGEST fan. I love you. 37) Starting today, I want to do everything that I possibly can to let you know that I love you more than anything else in this world. I love you, old man. 38) Dad, my love for you is a mix of friendship, respect and family ties. Thanks for everything. 39) You stood in front of me to protect me when I was vulnerable. You stood behind me to catch me when I fell. You stood by my side to support me when I was alone. Thanks for standing by me all the time, love ya dad. 40) There may be a lot of amazing people in the world. But the best and the most amazing of them all is you, daddy. I love you.